For a certain period of time, patients arrive at the hospital every day for an examination. It has initially 7 doctors. Each doctor can treat only one patient per day, but sometimes there is a shortage of doctors, so the remaining patients are sent to other hospitals. Every third day the hospital makes calculations and if the count of untreated patients is greater than the count of treated ones, another doctor is appointed. Appointment takes place before the daily patient acceptance begins. 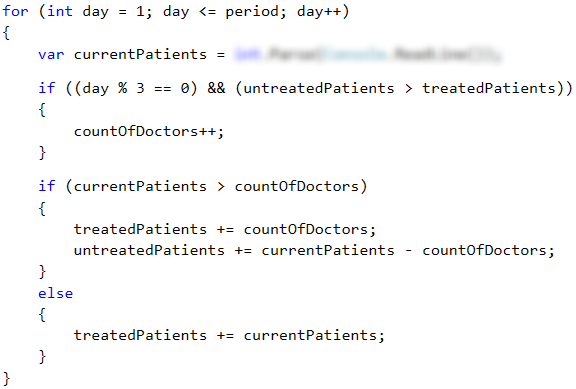 Write a program, that calculates for a given period of time, the count of treated and untreated patients. On the first line – the period, for which you need to make calculations. Integer in the range of [1 … 1000]. On the next lines (equal to the count of days) – count of the patients, who arrive for treatment for the current day. Integer in the range of [0 … 10 000]. and untreated ones – 20 –> New doctor is appointed. Total: 23 treated and 21 untreated patients. The period in which we have to make the calculations is read from the console and saved in the period variable. We will also need some helper variables: the number of treated patients (treatedPatients), the number of untreated patients (untreatedPatients) and the number of doctors (countOfDoctors), which is initially 7. With the help of a for loop we iterate through all days in the given period (period). For each day, we read from the console the number of the patients (currentPatients). Increasing doctors by requirements can be done every third day, BUT only if the count of untreated patients is greater than the count of treated ones. For this purpose, we check if the day is third one – with the arithmetical operator for division with remainder (%): day % 3 == 0. If the day is third one, the remainder of the division by 3 will be 0 (3 % 3 = 0) and the check day % 3 == 0 will return true. If the day is second one, the remainder of the division by 3 will be 2 (2 % 3 = 2) and the check will return false. If the day is forth one, the remainder of the division will be 1 (4 % 3 = 1) and the check will return again false. If day % 3 == 0 returns true, the system will check whether the count of untreated patients is greater than the count of treated ones: untreatedPatients > treatedPatients. If the result is again true, then the count of doctors will be increased (countOfDoctors). Increase the value of the variable treatedPatients by the count of doctors (countOfDoctors). Increase the value of the variable untreatеdPatients by the count of the remaining patients, which we calculate by subtracting the count of doctors from the count of patients (currentPatients - countOfDoctors). If the count of patients is not greater, increase only the variable treatedPatients with the count of patients for the day (currentPatients). Finally, we need to print the count of treated and count of untreated patients. Test your solution here: https://judge.softuni.org/Contests/Practice/Index/511#3.